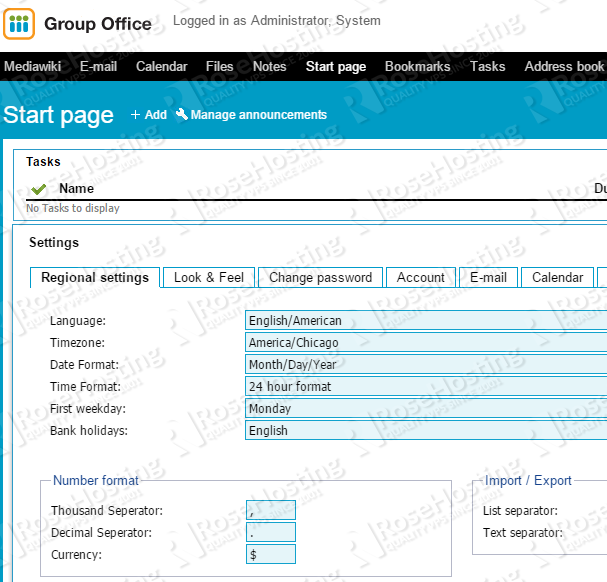 Group-Office is an easy to use, open source groupware and CRM application. It allows users to share projects, tasks, notes, files, calendars, e-mail and more with co-workers and clients through a web browser. In this step-by-step tutorial, we will show you how to install Group-Office 6 on an Ubuntu VPS. PHP > 5.3 with mcrypt and pspell extensions enabled (latest PHP version is recommended). MySQL >= 5.3 installed on your Linux virtual server (latest MySQL version is recommended). Do not forget to change ‘groupoffice-password’ with a strong password for your ‘groupoffice’ MySQL user. Optionally, install Ioncube loaders to enable the professional modules. Please note, if you like to use the professional modules, you need to purchase a professional license for Group-Office. Copy the appropriate ioncube module to the PHP modules directory. For example, if you have PHP 5.5.x version installed on your server, copy ioncube_loader_lin_5.5.so file. If you have PHP 5.4.x version copy ioncube_loader_lin_5.4.so file etc. Also, create a protected directory for storage outside of the document root (e.g. /opt/group-office). This directory should not be accessible through the web server. That is it. The Group-Office installation is now complete. Of course you don’t have to do any of this if you use one of our Ubuntu Hosting Services, in which case you can simply ask our expert Linux admins to install Group-Office for you. They are available 24×7 and will take care of your request immediately.